This signature campaign launched by the Hibakusha is making a significant contribution. Ambassador Whyte, the Chair of the negotiation conference of the prohibition treaty requested the Japanese movement to bring many signatures to the conference in June. In response to the request, 2.96 million signatures were presented to the second round of the negotiation conference by the representatives of Nihon Hidankyo, which contributed to the adoption of the treaty on July 7. The role of civil society is more and more needed to promote the effectuation of the treaty; and the “Hibakusha Appeal” signature campaign is the answer. We will make every effort to attain the target of collecting hundreds of millions of signatures by 2020. 1) Gensuikyo will expand cooperation and support for the signature campaign among all organizations and individuals in the Civil Alliance for Peace and Constitutionalism and every field, including religious communities, sports, arts and culture. We will request all the mayors who have endorsed the Hibakusha Appeal to involve their local governments and citizens in the signature campaign. 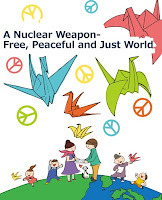 We will call for Hibakusha’s participation to and submission of collected signatures at the 2nd PrepCom of the 2020 NPT Review in April and the UN High-Level Meeting on Nuclear Disarmament in May this year. On July 7, marking the first anniversary of the adoption of the prohibition treaty, nationwide joint actions will be planned. 2) We will explore possibilities of promoting the signature campaign internationally. It should be pursued through: i) Approaching Catholic churches world-wide and all the member cities in the Mayors for Peace; ii) Sending Hibakusha speaking delegations to many countries; iii) Proposing international joint actions, including the Hibakusha Appeal signature campaigns (developing the “Peace Wave” actions proposed by the 2017 World Conference) and holding international consultation on the promotion of the signature campaign. 3) Dissemination of information on the inhumanity of nuclear weapons lays the foundation of our movement. We will hold more A-bomb exhibitions both in Japan and internationally. In the lead up to the 2018 World Conference, renewed efforts should be made to send out A-bomb photo sets to grass-roots groups around the world. At the parliamentary level, although the forces supporting the treaty is minority, the key is the people’s opinion in favor of the treaty and it is necessary to strengthen specific activities to urge the government to sign and ratify the treaty. 1) Having our sights set on the next national election (2019 Upper House election), we will call for the inclusion of the joining of the Prohibition Treaty as one of the common policies upheld by the coalition of opposition parties. To this end, we work together with the citizens and opposition parties both at the national and local levels and with the campaigners for the “Petition for the protection of Article 9 and the Constitution of Japan”. 2) We will request all members in the Lower and Upper Houses and local assembly members to urge the government to support the treaty. We will seek adoption of resolutions by local assemblies to urge the government to support, sign and ratify the treaty. 2) Gensuikyo will continue to plan Hibakusha speaking tours and dissemination of A-bomb photo sets/panels. At the same time we will strengthen activities to spread internationally the “Hibakusha Appeal” signature campaign. 3) For achieving the denuclearization of Korean Peninsula and peace in East Asia and promotion of the prohibition treaty, Gensuikyo will plan to organize an international symposium and joint actions in Seoul, in cooperation with peace movement organizations of the Republic of Korea. 1) The Nationwide Peace March against A & H Bombs which started in 1958 will mark the 60th anniversary this year. Through this year’s march, we will further strengthen cooperation with local governments to generate a broader public support for the Japanese government to support, sign and ratify the treaty to prohibit nuclear weapons. 2) For the International Youth Relay in the Peace March, we will invite youth marchers from nuclear weapon states. Listening to the Hibakusha testimonies and enhancing public support for the prohibition treaty should be highlights in the peace march. We will bring this anniversary Peace March a great success by the participation of many young people from outside and inside Japan. 1) With an aim of proceeding the abolition of nuclear weapons, we will make a success of this year’s World Conference as a venue for solidarity and cooperation between the UN/national governments and civil society. 2) The World Conference will be the place for collaborations and joint efforts of citizens and opposition parties to urge the Japanese government to join the prohibition treaty. It will also provide the forum to bring together in unity various movements, including for the prevention of the revision of Article 9; the abrogation of the war laws and reviving constitutionalism; the opposition to the construction of a new U.S. base at Henoko and victory in the Gubernatorial election of Okinawa; ZERO nuclear power plants; the transfer of resources from military to people’s lives; overcoming the social gap and eradication of poverty, etc. Looking to a revised constitution brought into force in 2020, Prime Minister Abe is planning to initiate the debate on the revision of the constitution in the current ordinary session of the Diet and swiftly carry out a national referendum. His aim is to kill the second clause of Article 9 to open the way for the unrestricted use of force by the Japanese military overseas, thus to create a “war-waging country”. We must stop this path leading to a militarist state. Working jointly in the 30-million people’s signature campaign to stop the constitutional revision, we must surround the Abe government with the overwhelming people’s demand for a total ban on nuclear weapons. The planned construction of a new U.S. base at Henoko will reinforce and fix the Marine Base in Okinawa as a “strategic sortie stronghold”, which is an integral part of the enhancement plan of the U.S. bases all over Japan. Achieving a victory in the governor’s election coming autumn has a decisive importance in stopping the base construction. We will strengthen our support to the struggles of the All-Okinawan people from every corner of the country. With the Trump Administration’s new NPR, the danger of nuclear weapons introduction under the Japan-US secret nuclear agreement is growing. We will continue to demand the abrogation of the secret nuclear deal and make every effort to watch and stop nuclear weapons entry into Japan. “Nuclear-Free Kobe” system should be adopted by other ports and airports across the country. Home-porting of the U.S. nuclear-powered aircraft carrier at Yokosuka should be reversed and we oppose all visits by U.S. warships at civil ports in Japan. Seventy-three years have passed since the atomic bombing in 1945, and the average age of the Hibakusha has now exceeded 80. Their desire to see a nuclear weapon-free world “while alive” is growing more and more intense. We must strengthen our activities to support the Hibakusha and work together with them so that the can continue to play their important role to achieve the elimination of nuclear weapons. 1) We oppose the resumption of operation of nuclear power plants and demand the shift from nuclear power to renewable energy sources. We oppose the extension of the treaty on the Japan-U.S. atomic energy cooperation. We call for the withdrawal from the clearly failed nuclear fuel cycle. 2) We protest against the government and TEPCO’s policy to terminate the compensation and abandon the victims of the Fukushima nuclear power plant accident and increase our support to them. Gensuikyo will plan a symposium to discuss the future in commemoration of the 7th anniversary of the accident.